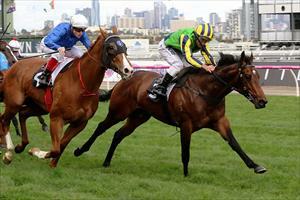 Saracino is our only runner for Saturday when he resumes at Flemington. Saracino will start in race eight, the Kensington Stakes (Listed) over 1200m where he will be ridden by Damien Oliver and jump from barrier three. Ballymore Stables won the race last year with Tivaci and Mike Moroney feels it is an intriguing race this year. “I’m not so sure it’s as strong a race as it was last year,” Moroney said. Saracino was gelded after disappointing in two starts in the spring. The four-year-old pleased Moroney with a recent jumpout and has done well since. “We can’t fault his work and his jumpout was very good but he did that in the spring,” Moroney said. “Race day will answer the question - if he turns up with his A-game then he’s right in it.